200 Years of Stevens' Mill exhibition - we need your help! The new bedstone is now in its place, and mill volunteers are concentrating on making sure that the mill is safe for visitors when we re-open on the 1st and 2nd of April for our "Easter Egg Hunt" event. 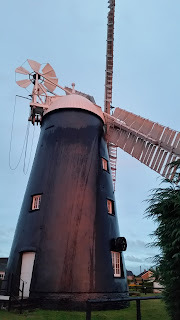 We are also preparing to celebrate the bicentenary of Stevens’ Mill in 2020 with a community exhibition, which launches at “Burwell at Large” this weekend. The mill itself for National Mills Weekend 12-13 May – come and enjoy free entry and a whole weekend of activities to celebrate the “Mill for All Seasons” project! If you would like to know more about the project and/or be involved in it, please contact the museum at museum@burwellmuseum.org.uk.